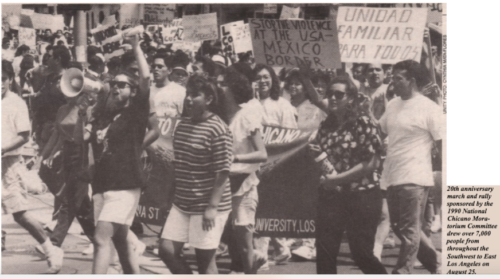 Unity Archive Project | 20 Years Later – The Chicano Moratorium El Grito continua: Self-determination and justice! AS THE MORNING SUN broke over East Los Angeles, Raza families stumbled out of bed, drawn to the kitchen by the drifting fragrance of tortillas hot off the comal. Many planned on attending the anti-­war demonstration at Garfield Park later that day. For the organizers of the Chi­cano Moratorium Against the Vietnam War, today was the day in which all their hard work, all the meetings and preceding community rallies, would culminate into a show of strength from their community. While billions were spent on the war, Chicanos faced economic despair and lacked political representation at all levels of government, while the prisons overflowed with brown faces who were the victims of poverty. The Vietnamese people were neither the cause of these problems nor the enemy. Instead, the common enemy was corporate greed and a system of na­tional oppression which rationalized the abject inequalities faced by Chicanos and other people of color in this country. 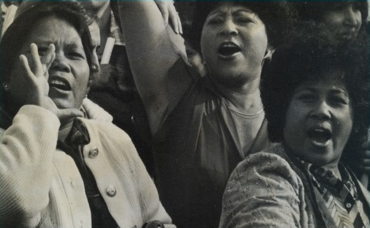 Over 25,000 people from across the Southwest converged on East Los Angeles that day, making the demonstration one of the most powerful events in the Chi­cano movement’s history. Its greatest ac­complishment was in the breadth of unity, as Raza from every social class, struggle, and progressive political belief came to­gether under a common banner: Self- determination and justice for our people! The peaceful event was rapidly dis­persed when an unmerciful force of 2,000 riot police swept down on the crowd as they sat enjoying the program. As night fell families searched for each other, cars burned in the streets, and three Chicanos lay dead. As we perch on the 1990s, Chicanos will soon become the majority in the South­west. Yet a quick glance around finds that one out of every two Raza youth will drop out of school. Budget cutbacks in com­munity programs close off alternatives to drugs and barrio warfare. Instead of build­ing more schools, California’s governor has chosen to build a sixth prison in East L.A., dump toxic waste, and spray malathion on our communities. U.S. interfer­ence in Latin America continues to force waves of immigrants across the borders, where they face migra abuse, low pay, and racism in the “land of plenty.” In many cities, at-large elections and gerrymander­ing still destroy the voting power of our community. Yet, the spirit that reigned on that August day continues to inspire genera­tion after generation of Raza to do the right thing – fight. As a result, many victo­ries have been won. Chicano Studies ex­ists today because young Raza intellectu­als are committed to building it. 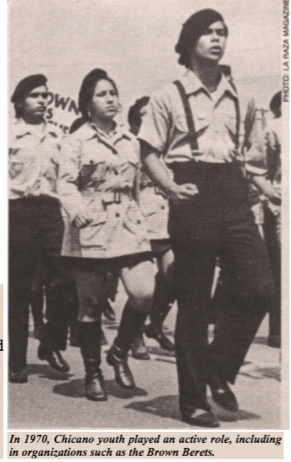 MEChA, which spearheaded the Chicano student movement, has grown dramatically dur­ing the last five years. The victory of dis­trict elections in small agricultural towns, Watsonville and Salinas, has proven that the door to political empowerment can be unlocked if the community is mobilized. Just like those 25,000 fighters who trav­eled to East Los Angeles 20 years ago, we still carry in our hearts the love of freedom and justice for all people, a legacy of rich lessons learned in the heat of nuestra gue­rra aqui, and the inspiration of many vic­tories. 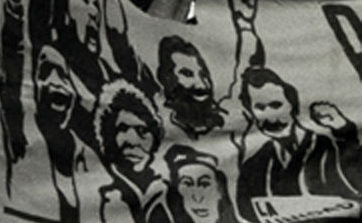 The Chicano Moratorium is more than an event to reminisce about; it is a Chicano holiday which should be recog­nized and commemorated by all people. Eva Martinez is a project assistant at the Center for Integration and Improvement of Journalism at San Francisco State University and is active in the Chicano/Latino community. Ruben Salazar, one of the casualties of the Chicano Moratorium, was killed by a tear gas canister projectile as he sat in the Silver Dollar Cafe waiting for the riot out­side to end. At the time of his death Ruben was both a Los Angeles Times columnist and the News Director for KMEX, a major Spanish- language radio station. His accurate, uncompromising portrayal of the Chicano community had brought him several journalistic awards and the respect of the community. His untimely death brought a sorrow which reached far beyond the bounds of the Chicano com­munity. 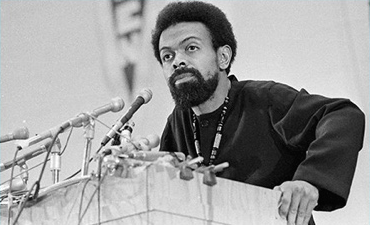 The movement lost a man of commitment, peace, and compassion. A man who had used his craft toward ending suffering and misery.